This assignment — an AUTOMATON — is due Monday, November 10th. You may work in pairs, and are encouraged to do so. This is a very good time to learn how to use the laser cutter. 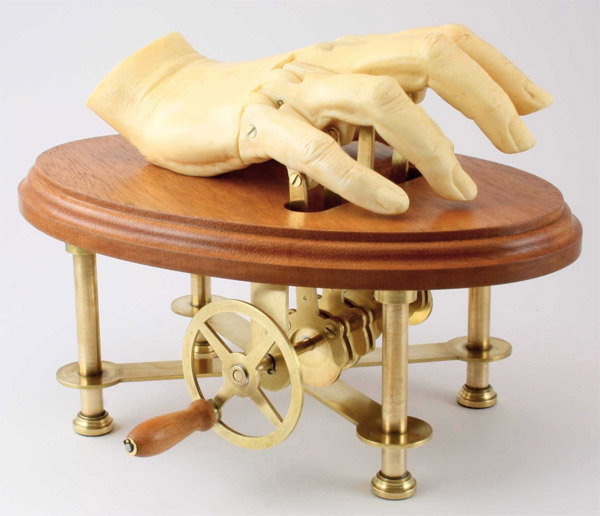 Assignment: Make an automaton or other kinetic artwork. It should have an expressive behavior (or behaviors). Optionally, you may use one passive sensor (such as a photocell) to allow it to respond to the viewer’s proximity. A video demonstrating your project working, uploaded to YouTube, embedded in the blog post. A written narrative of 150-200 words, describing and evaluating your goals, process and results. Include a discussion of the roles you each assumed, if you worked with a partner. Try to imagine making a sculpture, in which the interesting thing is how it moves (or behaves), and not necessarily how it looks. Does your project go through a specific sequence of motions on a schedule? Or is it interactive, thus responding in a contingent way to variable conditions? (Both are fine). Is your project’s movement organic? Is there a way to control its movement, through code, to make it moreso? What is the concept behind your work: Is it figurative? Abstract? Do you achieve apparent complexity with simple means? (I.e., can you use just a small number of motors to control a deceptively interesting system)? More on 4-bar linkages , converting rotary to linear motion, continuous to intermittent motion, etc.